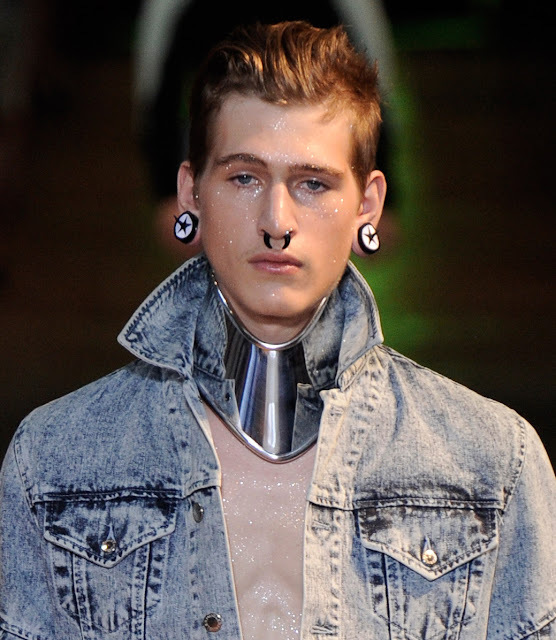 From the Paris Mulger Spring/summer 2012 catwalks, we see stone washed denim teamed with armoury like jewellery pieces. It reminds me a bit of The Warriors film about the New York gangs. This hard edge look is both preppy and tough at the same time. Look out for more out-there men's jewellery pieces. Does some amazing stuff with pearls. See for yourself. Like sunken treasure, this chunky resin piece is heavy with the weight of water and lost jewels, i love how a piece of jewellery can tell a dramatic story. 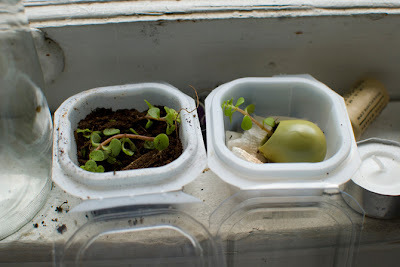 I found this on badtofu, one of the best inspirational blogs 've found lately. The combination of handmade vintage with modern sharpness is a nice combination. Perfect photography also helps. From a new blog of one of my friends. Check it out. 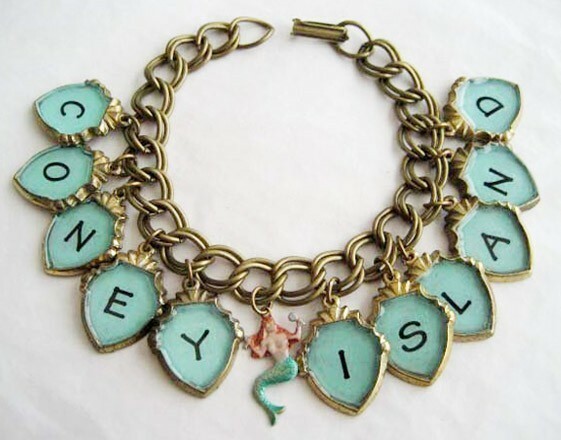 Kitsch Coney Island, gotta love it! 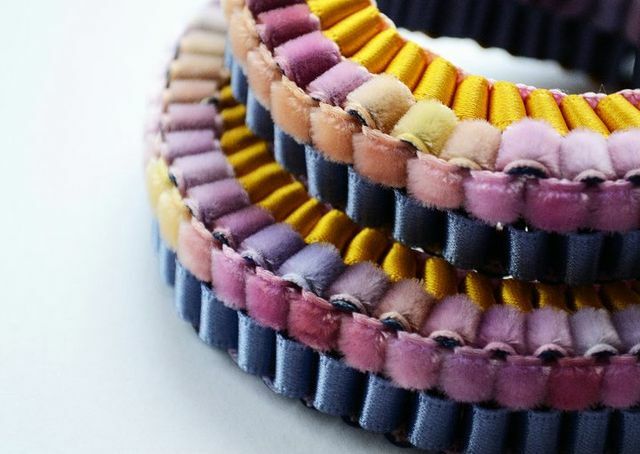 These lovely ribbon bracelets by Emma Calvert caught my eye because of the beautiful colour combinations mixed with the soft texture of velvet. I really love the delicacy of the fixing. The photos are thanks to Style Bubble. All things 90s seem to be the trend of the times. 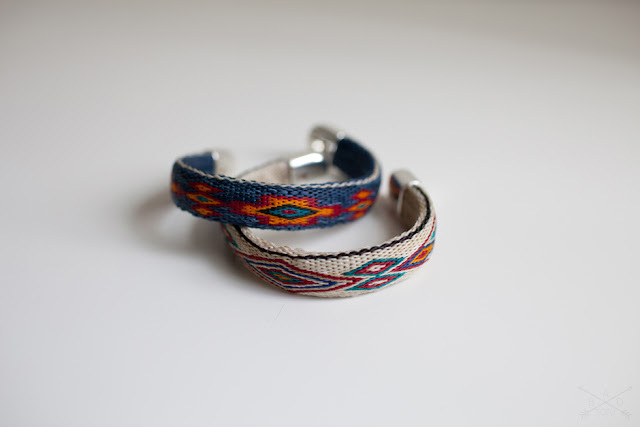 I love these mystical, slightly urban hippy pieces. The remind me of the crystal shops they used to have in every shopping centre in australia when i was growing up. At the front of the shop they would have a big crystal like amathyst open and turned into some kind of water feature. Along the walls would be all different types of stones in order including little cards describing their healing powers. There would be wind chimes hanging and pipe organ music playing.... oh, it takes me back! All things including the sun and moon and stars fit into this category. 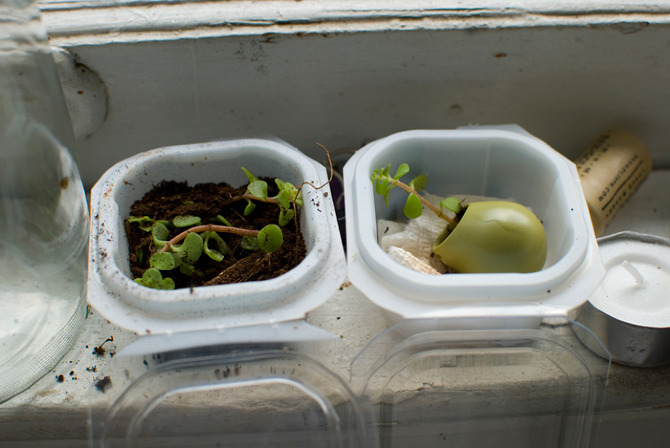 These two pieces below are by Alexandra Raphael. 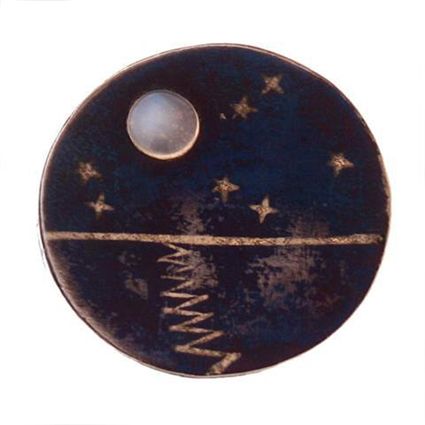 Her pieces all include sun and moon motifs and are inspired by Native American legends and the like. 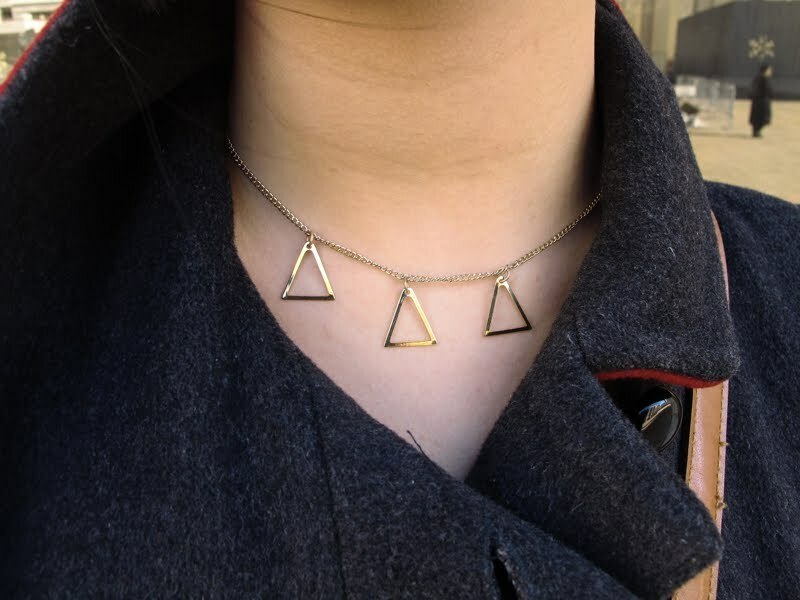 These are the authentic hippy jewellery which she has been perfecting for years, i'm sure there are going to be lots of rip offs of her stuff as this Modern Talisman trend gains momentum. We have already seen the Peace Sign take off and i remember that one big time from when i was 16. There is something really innocent about these motifs which basically bring us back to wanting to believe in something again, even if it is a mystical force. 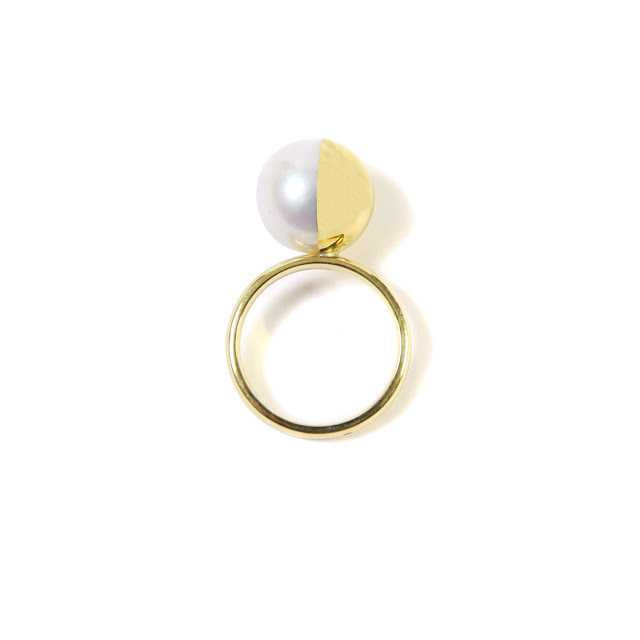 The clarity and simplicity of this ring makes it modern whilst the material and chunkiness take us right back to the 90s. Watch this space for more 90s inspired jewellery trends.... i wish i hadn't thrown out all my long glass bead necklaces! Lots of African tribal jewellery is still around, but its now less in your face and much prettier, delicate and subtle. I know subtle isn't really the word to use, but it is compared with the neck breaking breast plates and massive tribal jewellery of the past seasons. 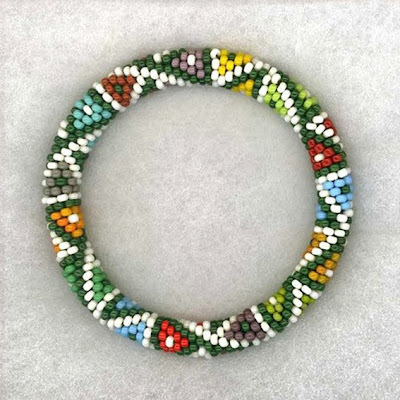 I'm not an expert on jewellery or African tribal dress, but I have definitely seen a lot of fine beadwork being incorporated into the material palette of western fashion jewellery. 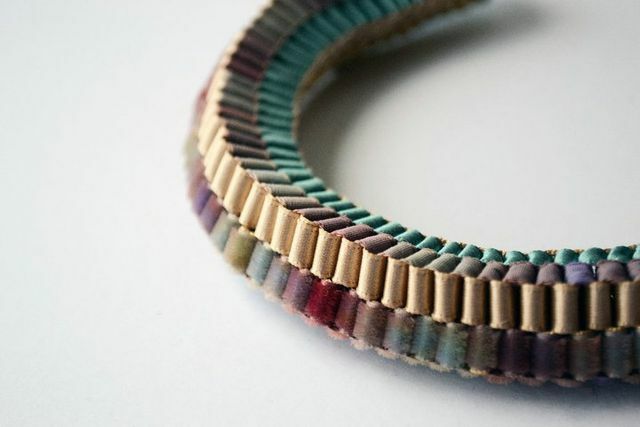 Whether it be strands of brightly coloured thread mixed with chunky sem-precious stones or tubular pieces decorated with patterned beads, it it a really fresh look which adds a bit of depth to the influx of high street outfits that we see everywhere. 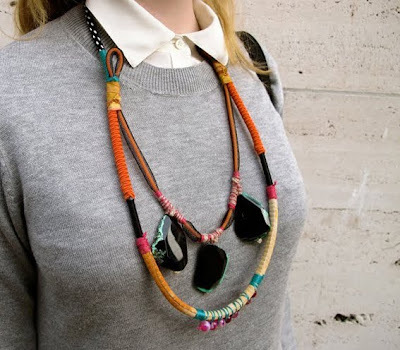 This necklace here on Phillip Lim's catwalk in Autumn/winter 2011/12 uses wrapping techniques in a heavily stripped down and simple piece. 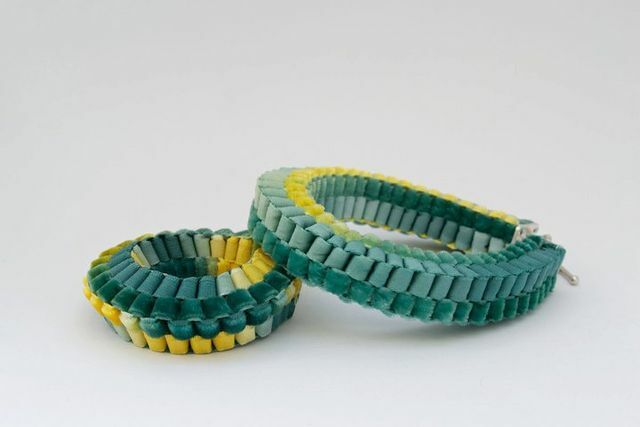 The subtle clues like the splash of bright colour and the tubular construction make reference to this beautiful and ancient style of jewellery design originating in Africa. Delicate, spindly jewellery is an important theme at the moment. 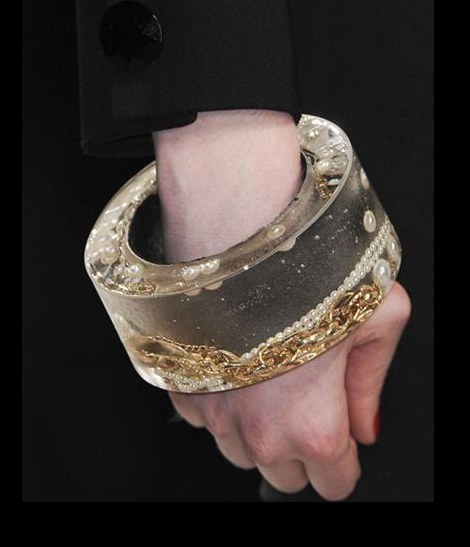 Fine details and shapes highly contrast with all the chunky massive jewellery also an important trend. These pieces all feature simplicity and reduction as a key design theme. 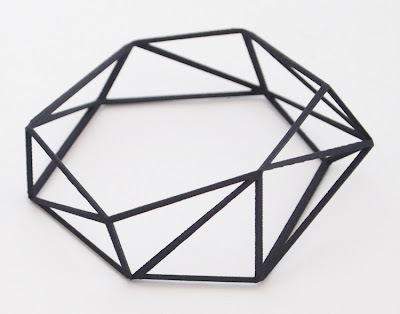 This is a bracelet by Goncalo Campos, it is made up of varying sizes of triangles, looking like a wireframe structure. Very architectural. I particularly like the matt black finish which reminds me of raw materials used in building and metal work. 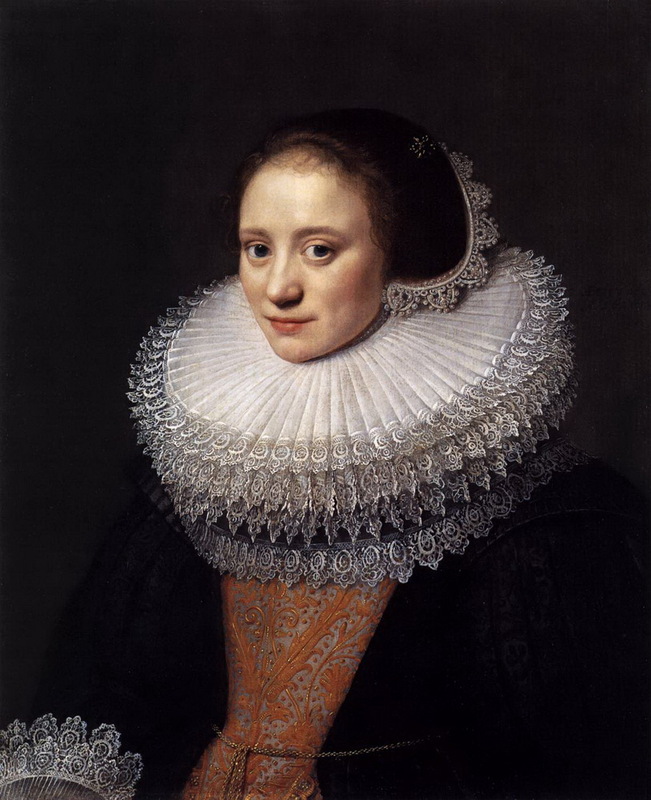 These earrings look as though there is something missing, but simply consists of what most people would regard as just the fixings with the embellishment missing. 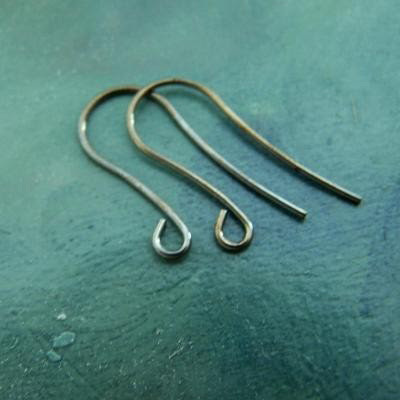 They are called 'ear wires' and were found on etsy by the seller 'philagree'. I love that it is about what is not there rather than what is there. 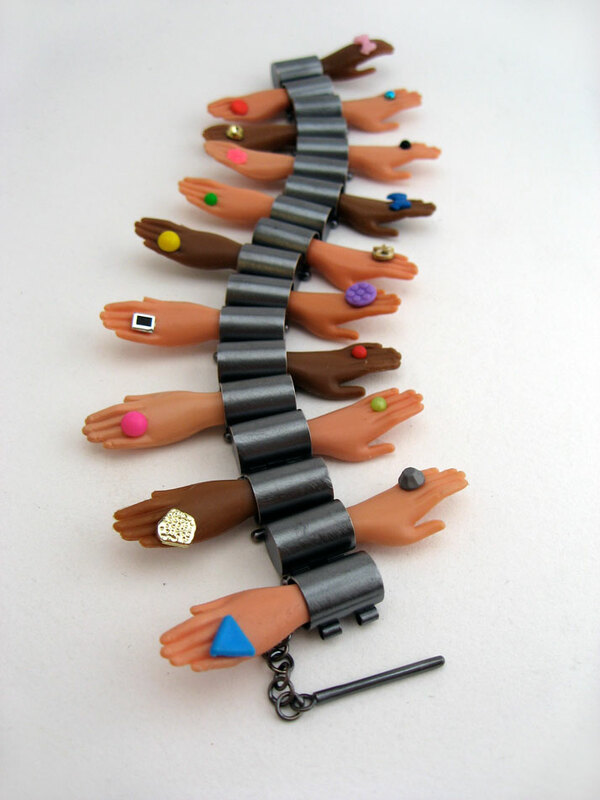 Margeaux Lange, the New York born jewellery designer has done these wicked pieces made from the highly iconic barbie. The elements are abstracted and take on a completely different vibe from their original elements. The pieces are nostalgic and surreal at the same time. 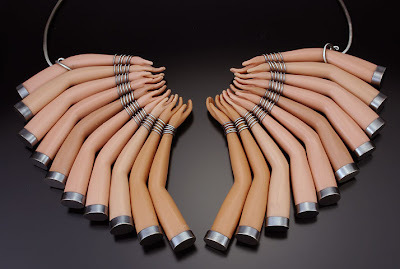 Both a bit creepy and fun, the details like the rings on these hands jump out and when i look at them i see detail i never really noticed before. Just like eating meat, I love how Lange has used up all the elements of the Barbie in the different jewellery pieces, making full use of the entire Barbie corpse! 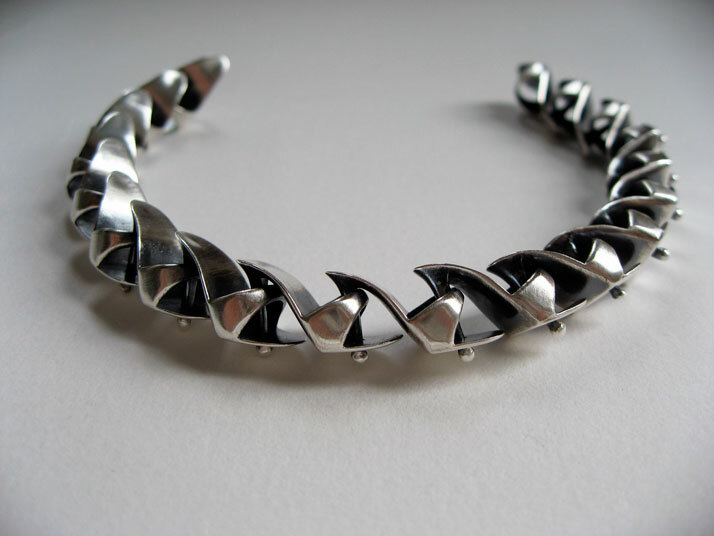 The fantastical pieces when re-contexturalised become barely recognisable as their original parts but form new shapes and pieces inspired by current fashion trends for example, this tribal necklace above made out of Barbie's left and right arms. 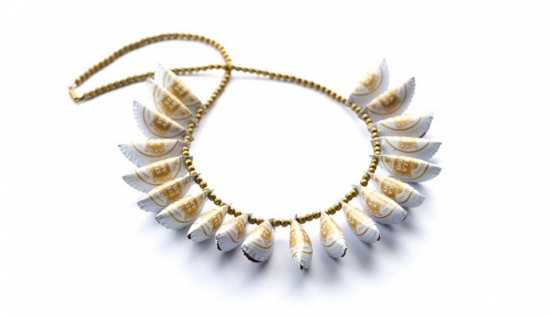 Its not the first time i have come across jewellery made from elements of dolls, but definitely one of the nicest executions i have seen... pardon the pun. 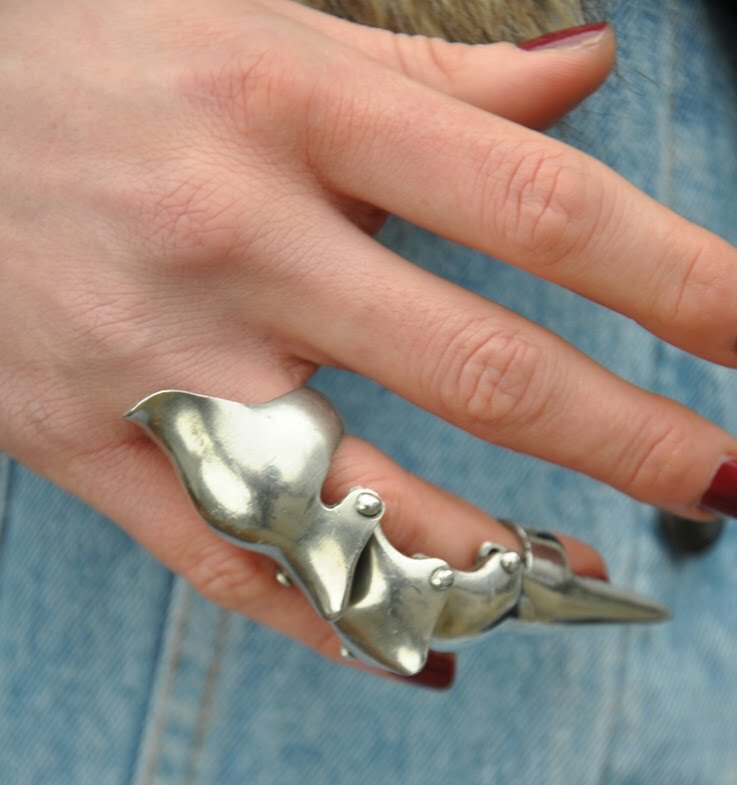 I love these agressive looking articulating rings. 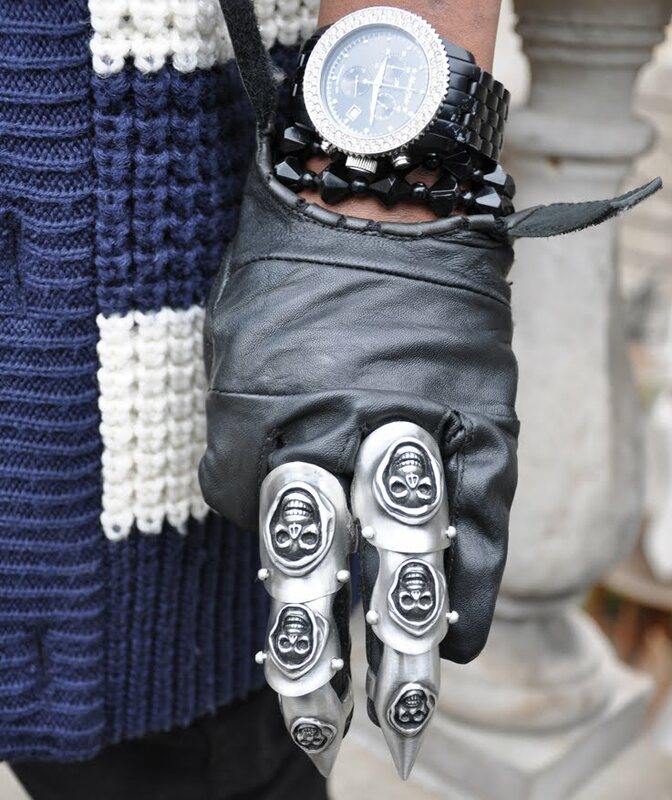 They have a gothic armour feel to them and cover the whole finger. These have been really popular lately for both men and women. 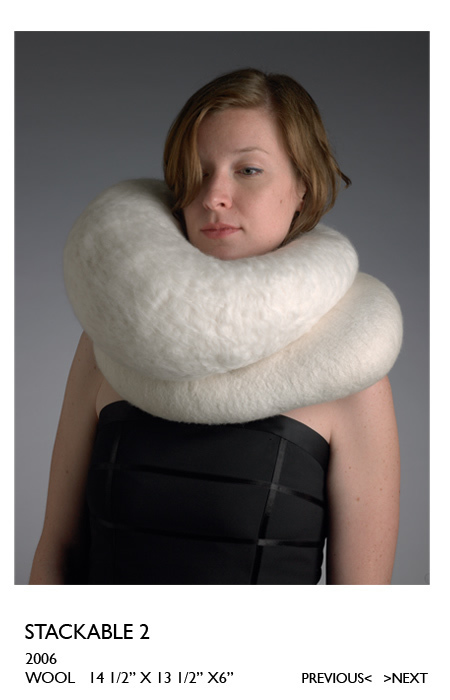 I really feel as though jewellery is becoming more and more unisex. 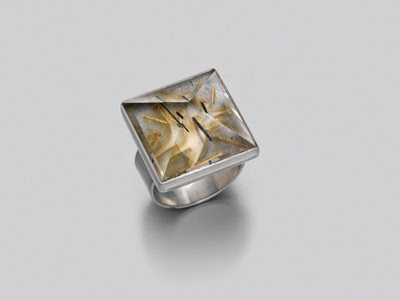 There are loads of rings in Topman that i'm loving right now, they are just too big to wear for a woman. 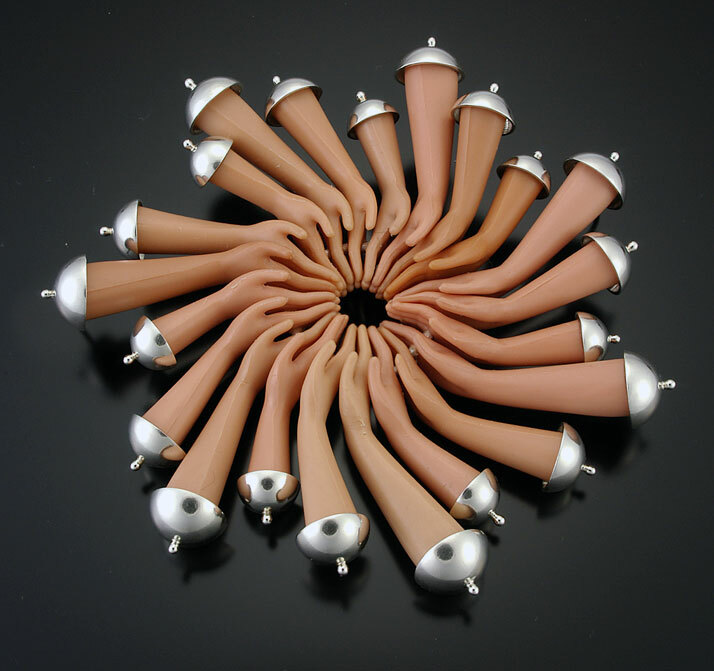 They are really playful and fun and cheap enough to invest in without too much commitment. Intricately detailed patterns and layered and stacked, these rings are really in your face and verge on being knuckle dusters. Some of them even include a sharp nail detail. Perfect for a saturday night out in shoreditch! 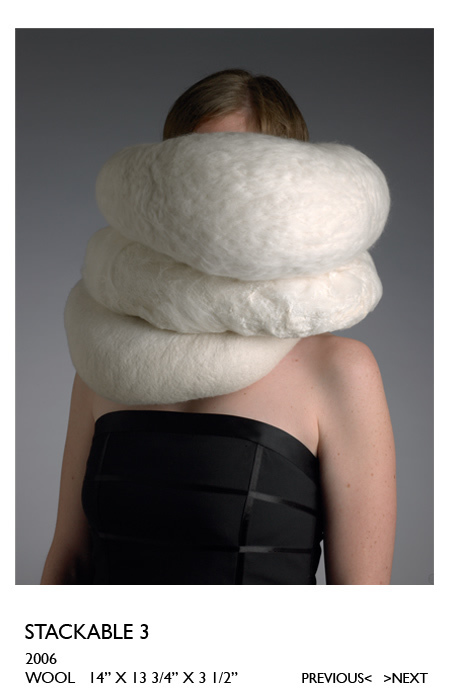 I couldn't resist posting this slightly strange, bordering on ridiculous piece which goes under the guise of jewellery. 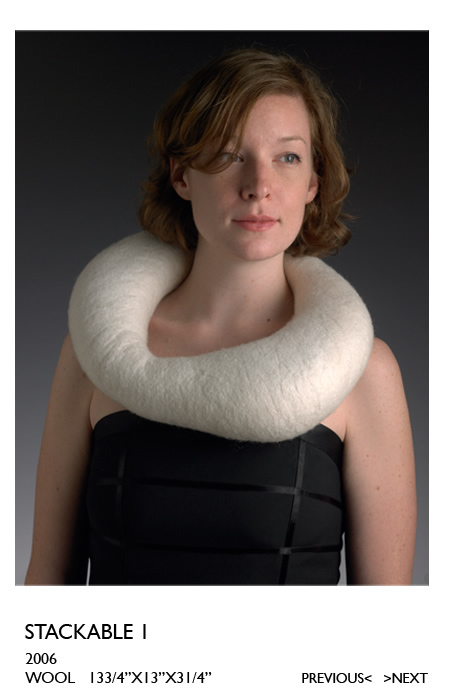 It also doubles as a in-flight neck pillow for long haul flights. I particularly like the result when you tip it over the limit of 'stackable' with 3 for bad face days. 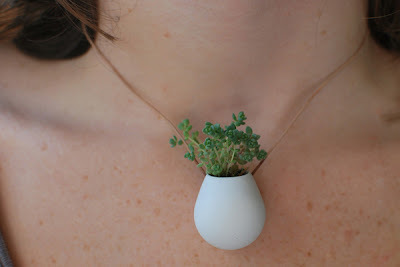 I think these little necklaces with miniscule plants inside are just adoreable. 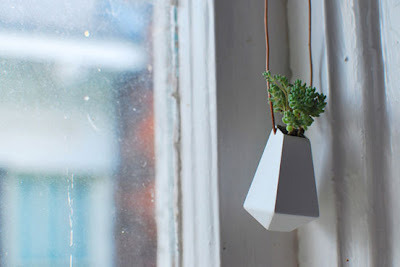 Its not often i go for cute tiny little delicate pieces, but this one in particular makes me smile. 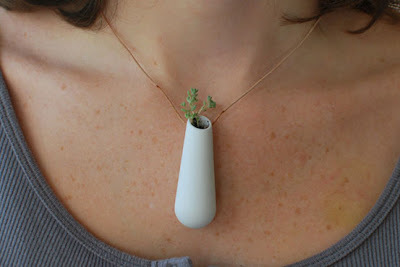 She calls them wearable planters, featuring tiny plants such as succulents in tiny pots to wear around your neck. 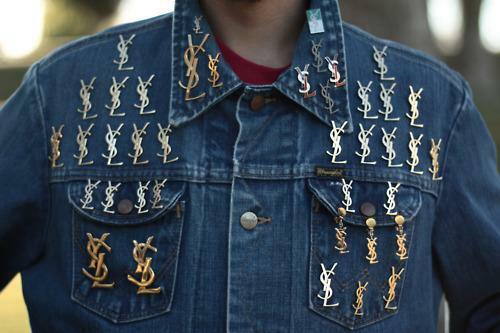 I personally love the concept of wearing something living on you. Sort of like being able to take your pet to work. I think if i had a little bit of herb such as sage worn around my neck during the day it would be a real pick-me-up, like having a sniff of essential oils to get you through the day, but the real thing. I am a big fan of Nicholas King. I saw his new collection recently at London Fashion Week Exhibition. The resin pieces mixing a bit of vintage with a bit of mad scientist are irresistible. 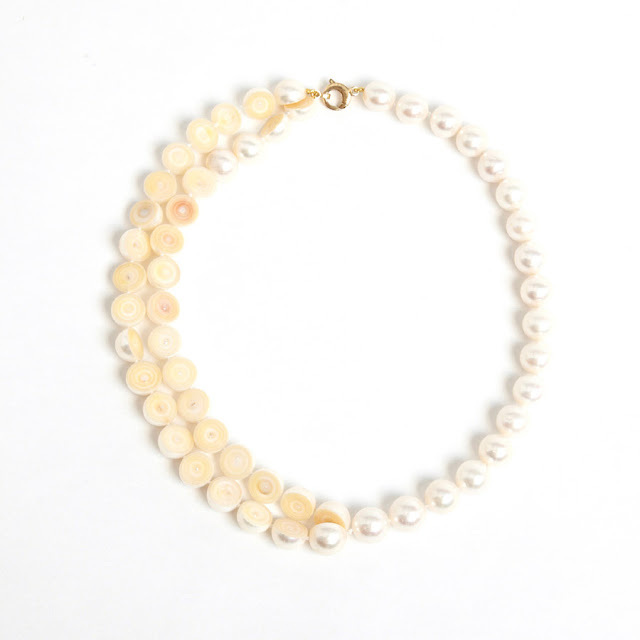 This resin necklace is embedded with watch bits and pieces as well as little pearls and other treasures. It reminds me of what you find when you empty your jewellery box out onto a table. 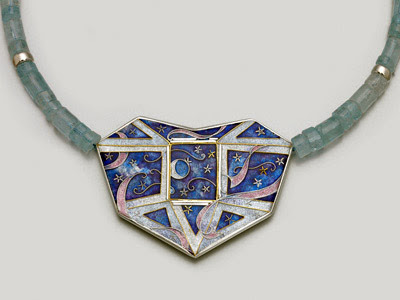 I really love the chain on this necklace, the fan shaped pendant has a vintage shanghai feel to me. 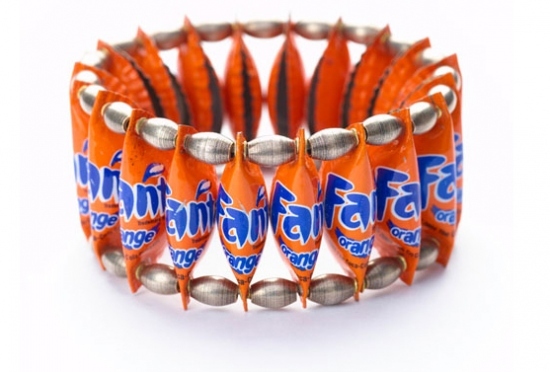 Reminds me of my grand mother's costumer jewellery from the 50s. 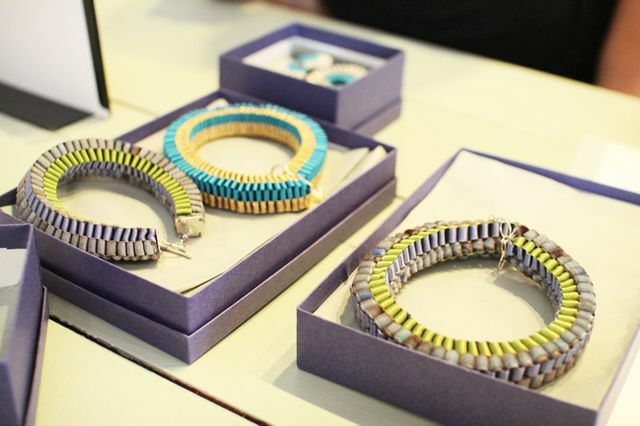 I popped down to the London Fashion Week Exhibition earlier this week and checked out some jewellery and accessories. I have to say, this was one of my favourite things to see. 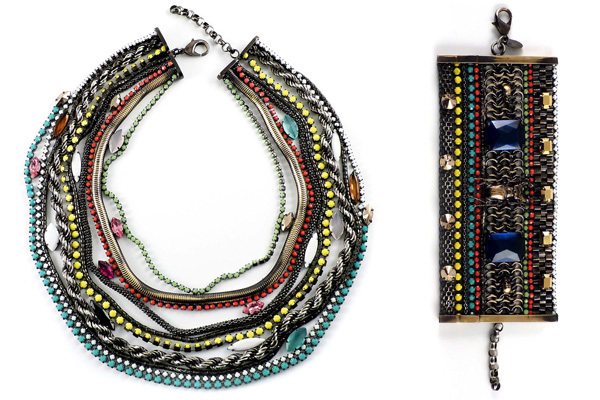 Its the neon vintage collection by Detroit originated company-turned-international-superstars Erickson Beamon. Their stuff is simply exquisite. The hand painted neon stones contast so beautifully with the vintage settting and the colours themselves are so nice. Its like mixing a bit a 'street' with vintage which i think is a really nice combination and shows that although the brand is style encapsulated, it also knows how to have a bit of fun with this serious, yet playful collection.